A flood that thundered through eastern Nepal in July 2016 left a telltale seismic signature and caused more erosion than local monsoon rains, new research shows. A wall of water, not an earthquake, set the ground shaking in eastern Nepal on the night of 5 July 2016. People living near the village of Chaku scrambled for higher ground as the glacial lake outburst flood (GLOF)—the catastrophic drainage of a lake associated with a glacier—unleashed more than 100,000 metric tons of water down the Bhote Koshi River. Researchers now have measured the seismic signature of a GLOF for the first time and shown that such deluges result in more erosion than seasonal monsoon rains. Glacial lake outburst floods have been recorded around the world, but the Himalaya, with its thousands of glaciers, is particularly susceptible to these deadly, destructive events. But no one had previously analyzed these catastrophic floods seismically, said Kristen Cook, a geologist at the GFZ German Research Centre for Geosciences. Similar to recent studies with landslides, seismic observations of GLOFs might reveal a “fingerprint” for them that could shed light on their force and evolution, she explained. Curious, Cook directed her team to take a deep dive into data from the July 2016 GLOF. The researchers analyzed measurements from six seismometers that they had installed in response to the Gorkha earthquake in Nepal the year prior. “We had all of our instruments in the right place at the right time,” said Cook. The researchers recorded a distinct seismic signature: one peak in energy moving at roughly 9 meters per second and a second peak moving at roughly 5 meters per second. These seismic features correspond to the initial wave of water and the movement of entrained sediments like boulders bouncing along the river channel, the team proposed. This study provides “unique insight into the dynamics of these floods that is crucial for improving our understanding of the downstream impacts,” said David Rounce, a glaciologist at the University of Alaska Fairbanks who was not involved in the research. Using satellite imaging, Cook and her colleagues also showed that the GLOF moved boulders as large as 6 meters in diameter. 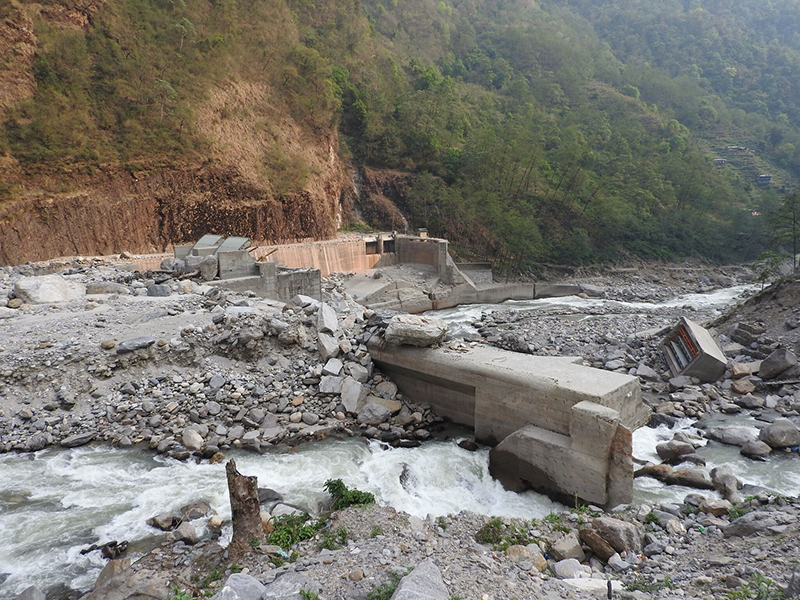 It furthermore widened the channel of the Bhote Koshi River by several meters. Post-GLOF surveys show that it also triggered landslides. Even the seasonal monsoon rains that dump meters’ worth of rainfall between June and September each year in the area aren’t capable of altering the landscape like that, Cook said. The team, whose study was published last week in Science, gave some further quantitative bounds: “The 2016 GLOF had an impact on the river and adjacent hillslopes that far outstripped that of the monsoon floods of 2009 to 2016,” they wrote in their paper. Glacial lake outburst floods occur regularly in the Himalaya: A major flood happens about once every 2 years. This regularity, paired with the uptick in GLOF frequencypredicted by some scientists as the climate warms, makes it especially important to study these catastrophic events, Cook explained. This month, she’ll be returning to Nepal to continue surveys of landslides triggered by the flood. Citation: Kornei, K. (2018), Glacial lake outburst flood captured in seismic recordings, Eos, 99,https://doi.org/10.1029/2018EO107643. Published on 10 October 2018.